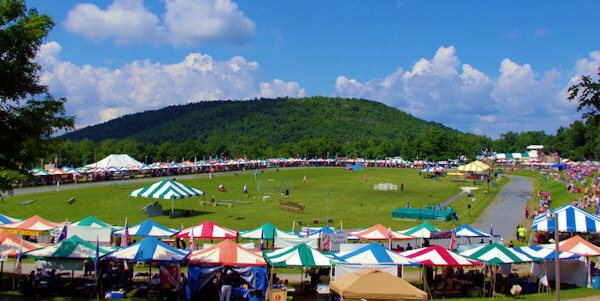 The Grandfather Mountain Highland Games and Gathering of Scottish Clans bring the color of hundreds of tartan plaids, athletic competitions, food, music and the clamor of bagpipe bands to the North Carolina mountains. Be a Scot for a day or the weekend. 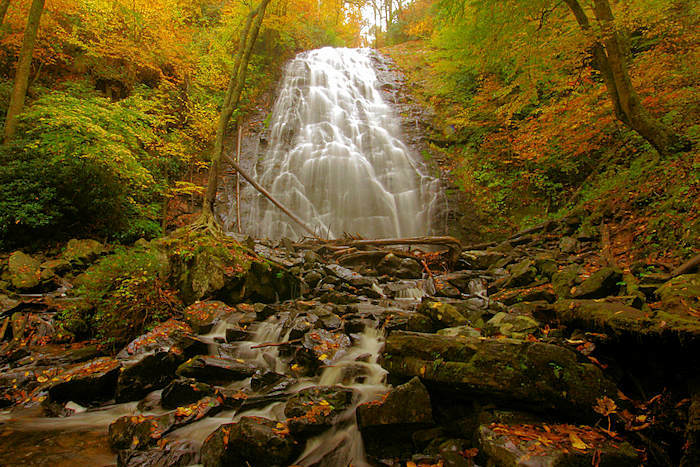 Stay in nearby Banner Elk with plenty of other things to do. The Grandfather Games are considered America’s grandest Games because of the spectacular mountain setting that is so reminiscent of Scotland. The deep blue peaks of 6,000-ft. Grandfather Mountain tower above a grassy green meadow ringed by 170 colorful tents. Thousands of Scots are dressed in tartan plaids, and the energy is amplified by the sounds of bagpipes and kettledrums echoing. 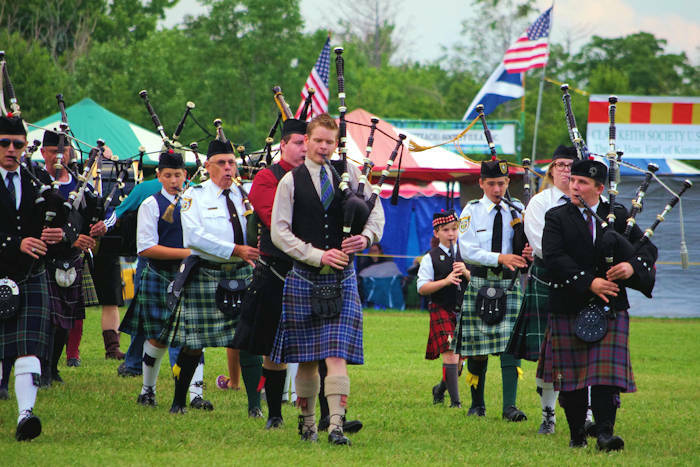 The Highland Games begin Thursday afternoon with a border collie sheepherding demonstration, Celtic entertainment, the running of “The Bear” and the opening ceremonies. Bring a picnic dinner or buy concessions at the Meadows to enjoy during the evening events during the least crowded day. The opening ceremonies begin at dusk with a torchlight ceremony where representatives of each of the 100 clans and 16 societies announce their family’s participation in the gathering. This “raising of the clans” proclaims that they have once again come together to celebrate their heritage. 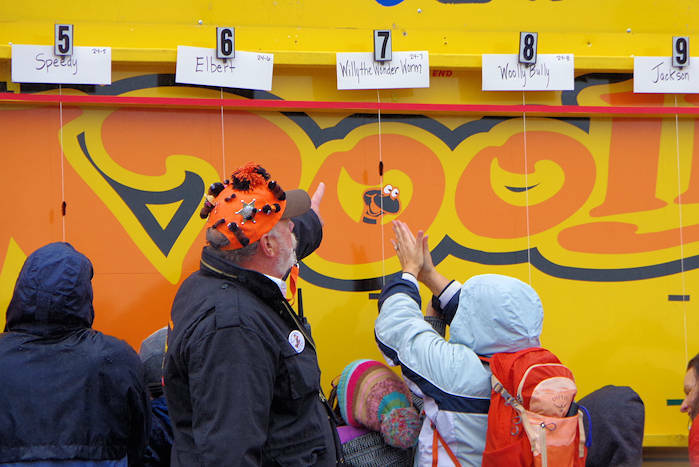 Prior to the torchlight ceremony, 800 people run a 5-mile footrace called “The Bear” that climbs 1,568 ft. in elevation from the town of Linville to the summit of Grandfather Mountain. Friday, Saturday and Sunday are filled with competition in heavy-weight Scottish athletic events; highland dancing competition; bagpipe band parades; piping, drumming and harp competitions; sheep herding demonstrations by Scottish border collies and concerts featuring a wide variety of Celtic music. At the center of the activity, the nation’s top Scottish athletes clash in traditional heavyweight events such as “Turning the Caber” and “Tossing the Sheaf.” The first requires an athlete to flip a telephone-pole-sized tree trunk end-over-end and the second challenges athletes to loft a 16-pound sack of hay over a crossbar more than 20 ft. above the ground. Other ancient tests of strength awaiting the brawny professionals are highland wrestling, putting the stone, the hammer throw and various weight throws. A test of extreme endurance is the running of the Grandfather Mountain Marathon on Saturday. Among the many sights and sounds of Scotland to be found on MacRae Meadows throughout the weekend is the popular open-air market set up adjacent to the parade grounds. Merchants sell Gaelic and tartan gift items while concessionaires sell Scottish meat pies to give visitors a taste of the highlands. There is also a tent set up to help guests trace their Scottish roots and learn more about their heritage. Adult tickets are $15 Thursday, $20 Friday, $30 Saturday and $15 Sunday. The tickets cover all activities in the meadows, which on Friday and Saturday last from early morning to midnight. 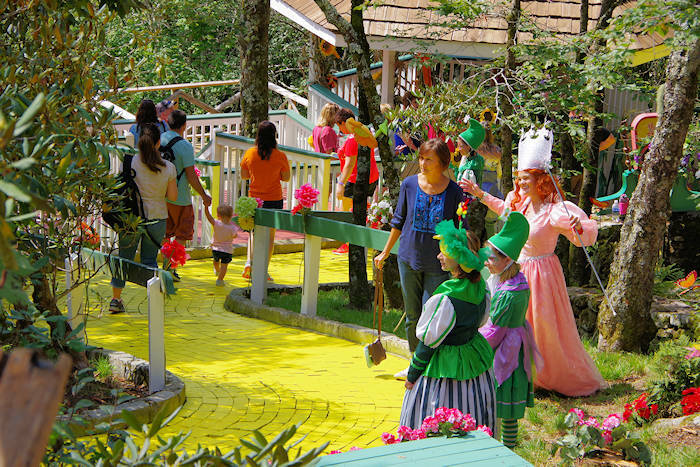 Tickets are $5 each day for children ages 5-12, with children under five free. Tickets are available at the field on the day of the event. Four-day tickets are also available online at gmhg.org. Adult 4-day passes are $75 and children’s passes are $20. 70 miles from Asheville, NC: Take I-40 East to Marion, NC. Take Exit #85. Turn left at the bottom of the ramp and go one mile to a stoplight. At the stoplight turn left and follow US 221 North to the entrance of Grandfather Mountain (about 30 miles). 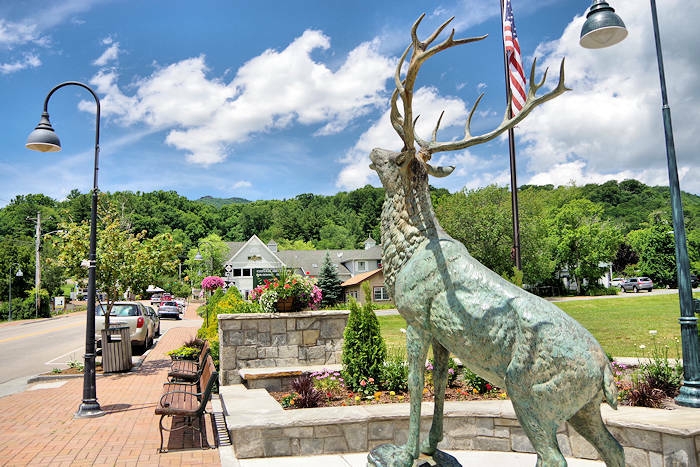 Located near the cool small town of Banner Elk. Parking is available on site at the Games field Thursday and Friday on a first-come, first-served basis with overflow parking at shuttle lots in Linville. Public parking is not available at the field on Saturday and Sunday. Shuttle service is provided between MacRae Meadows and satellite parking areas in Linville, Newland and Boone. The Boone shuttle runs during the day Friday, Saturday and Sunday. The Linville shuttle runs Saturday and Sunday and the Newland shuttle runs Friday and Saturday. Shuttle fees vary depending on the distance between the lots and MacRae Meadows. Tickets to the off-mountain evening events vary by event. For more information call 828-733-1333 or visit online at gmhg.org. Stay high in the Blue Ridge Mountains in a variety of vacation rentals, log cabins, condos, mountaintop homes and hotels. 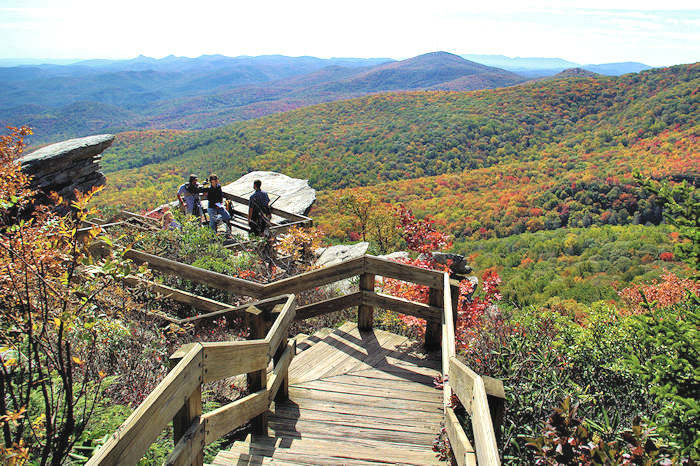 Near ski resorts, Grandfather Mountain and endless outdoor adventures.